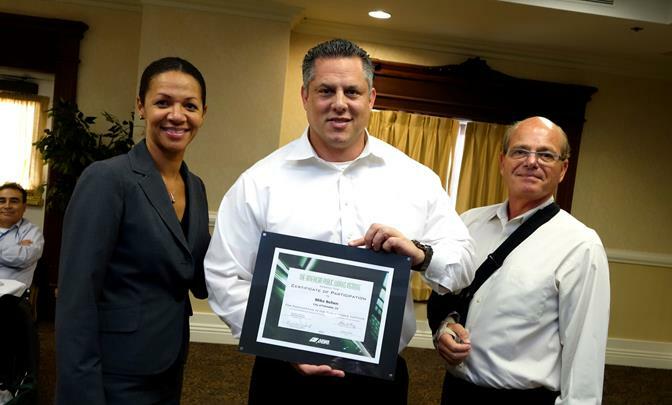 Pamela Manning (left) and Tony Antich (right) present a certificate of participation to Palmdale’s Mike Behen. PALMDALE – The City of Palmdale’s GIS/Transportation Manager Mike Behen recently became the first city employee within North Los Angeles County to complete the American Public Works Institute, a 90-hour, four module public works management and operations training program. “The Public Works Institute was created in 2007 in the same spirit as the other institutes in other American Public Works of America Chapters,” said Pamela Manning, Los Angeles County Public Works Business Representative and Co-Chair of the APWA Education Committee. “It was developed in response to the big leadership vacuum at the top level in Public Works organizations with retirements and a failing to pass on critical institutional knowledge. The intent is to engage those that have significant experience and history, and to share that with up and coming talent in order to prepare rising leadership for the challenges of today and tomorrow,” Manning said. The American Public Works Association (APWA) exists to develop and support the people, agencies, and organizations that plan, build, maintain, and improve our communities. Working together, APWA and its membership contribute to a higher and sustainable quality of life. For more information on the APWA, visit www.apwa.net. For more information on Palmdale’s Public Works Department, call 661-267-5300.